Goodwood - VW XL1: Can a city car be worth supercar money? VW XL1: Can a city car be worth supercar money? Carbon ceramic brakes, butterfly hinged doors, a carbon-fibre reinforced plastic tub, wind-tunnel honed aerodynamics, a seven-speed dual clutch automatic, rear-wheel drive, two seats, a mid-mounted hybrid powertrain – and more exclusive than a Bugatti Veyron. So which of the new breed of hypercars is this? It’s the XL1, and it is a hypercar but not perhaps in the way you may have been expecting. A clue is the badge on the nose: Volkswagen. 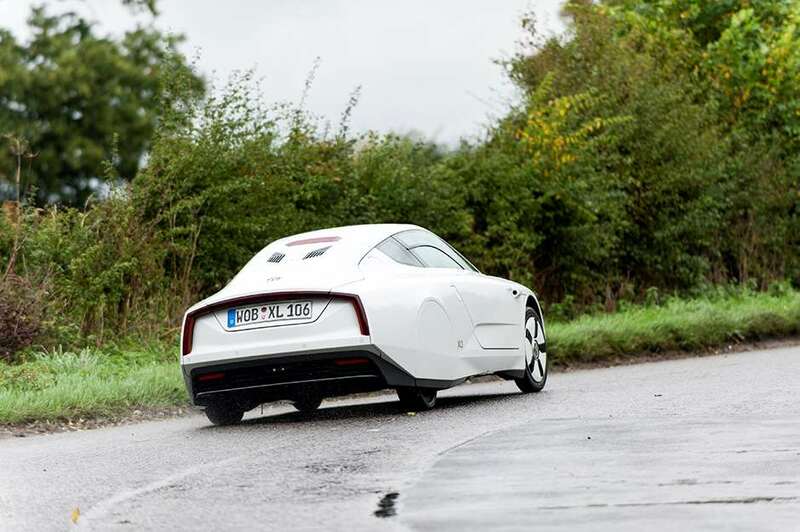 The XL1, now on sale in the UK at around £100,000, is not hyper fast but it is hyper economical. Like 313 miles per gallon (on the official combined cycle) and CO2 emissions of just 21g/km. It is the design and technology behind these figures that makes the XL1 so fascinating to performance car lovers. Sat in the garage at Volkswagen’s UK training centre, the diesel-electric hybrid XL1 looks as if someone’s reached into the future for it. Its shape is entirely dictated by its need to slip through the air as efficiently as possible. Its designer cites a shark as its inspiration, its purity something to behold, the detailing exquisite. Technically it’s a masterpiece. There’s nothing particularly revolutionary about its specification, rather its execution, which takes every element and hones it to extremes. The carbon-fibre tub uses a newly patented manufacturing technique, allowing it to provide incredible strength but weighing just 89.5kg. Polycarbonate windows, fixed carbon-fibre bucket seats with an offset position, video camera rear-view mirrors and a cabin that exhibits all the high quality fit and finish of a regular production Volkswagen. There’s 120 litres of luggage space behind the engine, the carbon-fibre weave in the boot reminding of the XL1’s exotic specification. The engine is VW’s 1.6-litre TDi four-cylinder engine halved to two cylinders and with a block made of magnesium to shed more weight. It delivers 47bhp, the hybrid element adding a 26bhp electric motor and lithium-ion batteries to deliver a combined 68bhp output (combined power outputs of hybrids rarely add up – ed). 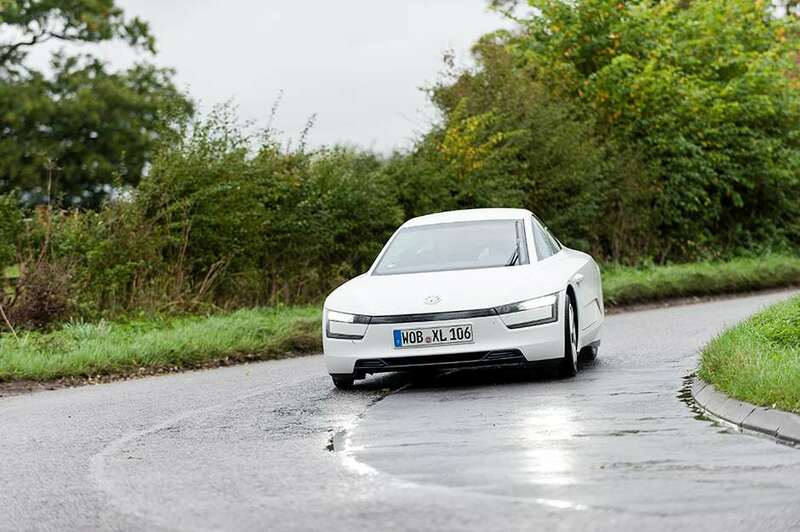 On electricity alone the XL1 will cover 31 miles, charging taking a couple of hours from 20 per cent capacity from a standard three-pin UK socket. Top speed is limited to 99mph. Any more would create the need for changes to its specification, demanding things like bigger brakes. And that would mean more weight and less performance. A petrolhead’s version is coming, however – powered by another twin-cylinder engine, but instead of being half a diesel it is likely to be the 1.2-litre 187bhp petrol twin from the 1199 Panigale superbike from VW Group company Ducati – complete with 10,750rpm red line. This quick version – possibly badged XLR and for release at next March’s Geneva Motor Show – is not available for driving yet but the XL1 is. And climbing aboard for the first time is quite an occasion. Most unusual is the proximity of everything. The cabin is narrow, though not claustrophobic, even with a passenger on board. Aside from pulling down the door, McLaren F1 style, and checking the small video screens instead of door mirrors the XL1 feels no different from any other hybrid to drive. Its narrow width allows you to use more of the road to straighten bends and maximise coasting and regeneration opportunities, but the performance feels city car adequate, and the refinement remarkable given its virtual prototype status. There’s a pleasing thrum from the two-cylinder TDi, its starting aided by a pulse of power from the electric motor. It’s all very seamless, the unassisted steering nicely weighted and offering lots of feel. Those super skinny tyres grip with remarkable tenacity, and while the brakes take a bit of practice to operate smoothly the XL1 requires no special driving ability. It is an extraordinary car that is actually quite ordinary to drive. Unlike BMW’s fully production i3, Volkswagen will only build 250 XL1s, 50 of which it’ll keep itself, making this super economical car rarer and more exclusive than that other extreme performance machine in the company’s catalogue – the Bugatti Veyron. Just 20-30 are earmarked for the UK, where it will cost around £100,000. A lot? Possibly. But just a fraction of what this technical tour de force actually cost to develop. GRR Garage: VW Passat Alltrack - running on fumes?